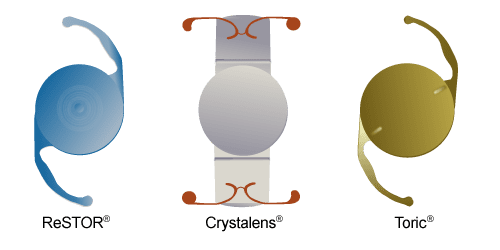 There are a variety of lens implant types available. These range from basic lens implants to sophisticated premium life-style enhancing lenses. The basic lens implant is covered by your health insurance. The higher quality and more advanced lens implants require some extra out-of-pocket contribution by the patient, but tend to provide either a higher quality of vision or more freedom from needing glasses. The basic lens implant will provide acceptable vision and functions well after cataract surgery. Most patients still require glasses to achieve their best distance and near vision. Refined vision lenses have a more sophisticated optic that has an aspheric design that is more closely matched to the optics of your eye. These implants provide better contrast sensitivity and an enhanced quality of vision under low light conditions such as night driving or walking around at dusk or at night. Multifocal and accommodating implants are about having a greater freedom from needing glasses for your daily activities. They reduce your dependence on glasses as compared to standard lens implants. They are designed to provide clearer vision both at distance (such as driving or golf), intermediate (such as computer use) and/or up close (such as reading). There are several types of these implants that are FDA -approved. Dr. Witlin has been certified to use all of these approved lenses. After reviewing the results of your comprehensive eye examination, Dr. Witlin will discuss your lens implant options and help you choose the lens that best fits your visual needs and lifestyle.